We don't do anything to celebrate May Day around here, which is surprising because we celebrate just about anything and everything. We have a birthday a couple days before and a couple days after, which is why it probably gets ignored. 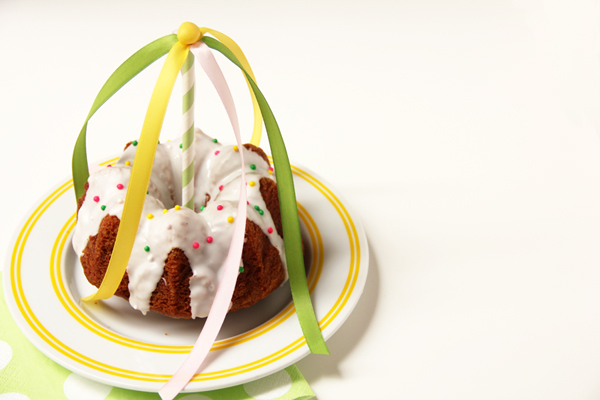 But this cute Maypole bundt cake is way too cute to ignore. If you are looking for a reason to celebrate May Day, I think this cake should do it for you. My in laws anniversary is at the beginning of May and they had a Maypole at their reception. These cute mini Maypole cakes will come in handy the next time we get together to celebrate the occasion. You can check out the details of these May Pole bundt cakes over at Studio DIY. I can't believe I didn't run into you at SNAP! What a bummer! I hope we'll get a chance to meet sometime in the future! They are teeny tiny bits of cute!